The soundtrack to the Coen Brothers' film about Greenwich Village's folk scene is slick, polished, and reverent to a fault. One could safely argue that the mainstream revival of Americana has its roots in the Coen Brothers. For decades, Americana remained a niche market until the Coens took The Anthology Of American Folk Music into the mainstream with their 2001 film O Brother, Where Art Thou?. The film's soundtrack, which featured the likes of Alison Krauss, Emmylou Harris, and Ralph Stanley, surprisingly became a mega-selling, Grammy-winning behemoth, and it's not difficult to see the connections between that album's cultural moment and the current Mumford-ization of the Top 40. Now, the Coens have another film that finds them examining the music of America's past, and they've assembled some of the same crew, O Brother producer T-Bone Burnett, in particular, to put together the soundtrack to Inside Llewyn Davis. Unfortunately, the end result is an album that doesn't quite click the way that one would hope. Burnett and co-producer Marcus Mumford (surprise, surprise) have made a curious move in putting together Inside Llewyn Davis' soundtrack: Rather than follow O Brother's example of collecting a rotating series of bluegrass luminaries, the soundtrack relies on Inside Llewyn Davis star Oscar Isaac as its musical center. In the context of the film and its backstory (Inside Llewyn Davis is a loose adaptation of the life story of Greenwich Village folk singer Dave van Ronk), the move to place Isaac front and center makes sense, and Isaac is a capable enough singer to pull it off. However, his vocal performances never reach heights beyond "pleasant", and his constant presence on the album bores after a few songs. Thankfully, Isaac is backed up by crack musicians throughout Inside Llewyn Davis. Particularly, Isaac's tracks with the Punch Brothers are fine listens, reliant as they are on the band's intricate and subtle arrangements. There are livelier moments on the soundtrack, many of which come when Isaac steps away from the microphone. John Cohen's grizzled take on "The Roving Gambler" is a delightfully shambolic take on the song, one that could have easily fit in with some of the field recordings on O Brother. The album shows an affection for Celtic folk, but while Isaac's studied rendition of Ewan MacColl's "The Shoals of Herring" falls, flat, the Chris Thile-led harmonies on "The Auld Triangle" give the song a haunting, unsettling feeling that's more than welcome on an album filled with straight-faced songs. Well, straight-faced aside from the humorous send-up "Please Mr. Kennedy". Written by Burnett and the Coens themselves, the song is a perfect send-up of the topical-yet-whimsical songs that were prevalent during the early '60s folk explosion. Parody is certainly the goal here (Adam Driver's baritone asides are played successfully for laughs), but it's also the one moment where Isaac loosens up, joining Justin Timberlake in an absolutely giddy performance. Some could argue that it's slight, but it has the sort of crackling energy that's all too lacking on the rest of the album. There's a lot to cultivate from exploring the music of the early Greenwich Village folk scene, and Inside Llewyn Davis' soundtrack does its best to find a new way to examine it in 2013. Still, as pleasant of a listen as it is, one can't help but think that there was a better way to do this, one with more of a creative spark than what's on display here. 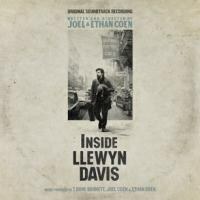 As focused and professional as it is, the Inside Llewyn Davis soundtrack is everything you wouldn't expect from the Coen brothers: measured, serious, and kind of lifeless.